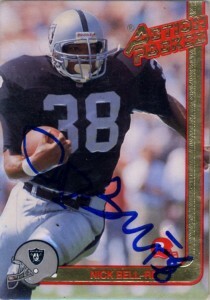 Nick Bell was drafted from Iowa by the Los Angeles Raiders in the second round of the 1991 draft. At 6-2, 255 he was a bruising powerback with highly deceptive speed and a vicious stiff arm. His rookie season would be limited to 9 games due to a bum hamstring. He’d start only one game but in garbage/ backup time Nick would still manage over 300 yards and 3 touchdowns. A whole season in 1992 would still not allow him to break the starting runningback lineup of the Raiders starting only one game again but this time making a bit over 350 yards. Named starting runningback Bell would be chomping at the bit to perform in 1993, but nagging injuries including an ankle injury suffered in training camp would continue to dodge him and give creedence to durability as a major problem for the young back. He’d start a career high 3 games, but averaging 2.7 yards a carry probably combined with the mounting injury concerns ended his career prematurely at the end of 27. Information of Nick’s whereabouts since retirement are sketchy. He has done some coaching in Cedar Rapids as a minor league football coach and a highlight video of him has recently appeared on YouTube.